Reham Khan, ex wife of PTI Chairman Imran Khan remains in limelight for several reasons. Previously it was her marriage with Imran Khan then their separation and now it is her tweets which does not let us forget her. This time Reham has tweeted about how media has been disgracing her since one year whereas no action has been taken in response. For over a year everyone watched quietly when the media was used to malign me. No one defended me & I was told to ignore it. ہم آپکو پاکستان کی سیاست میں ایک اچھا اضافہ سمجھ رھے تھے. 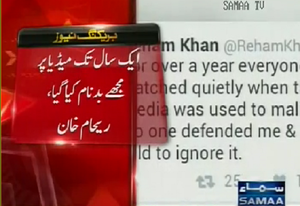 @rehamkhan1 all pti supporters even IK himself defended you always. IK ko tou apki fake degree ko b tv pe defend krna para tha. Remember?